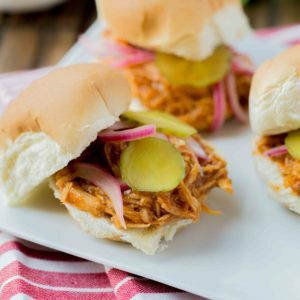 don’t miss a recipe! Subscribe to email updates. 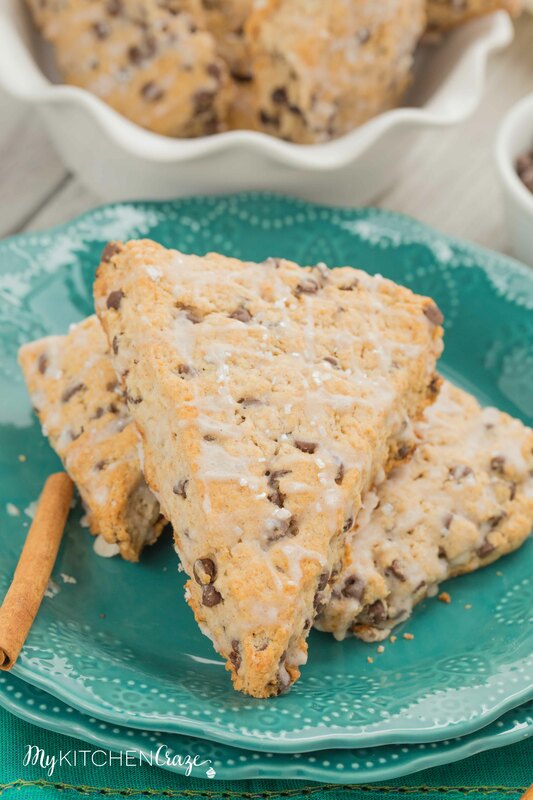 Cinnamon Chocolate Chip Scones are the perfect breakfast, dessert or snack. 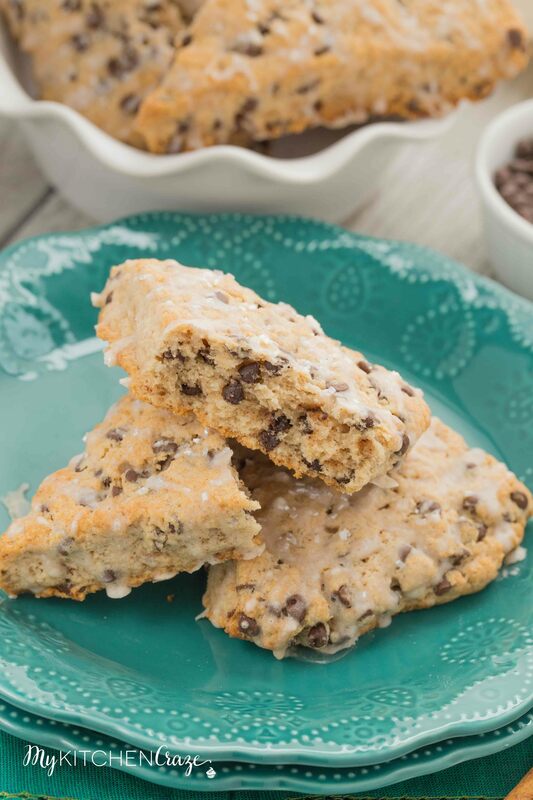 Flakey and chocolatey, these scones are delicious anytime of the day! Be sure to follow me on Facebook, Instagram & Pinterest to stay up to date on all of my recipes! Scones are used to be a new thing to me back in 2014. I never wanted to try them before because they always looked a little dry to me. Needless to say I was wrong. I’m not sure why I was so hesitant, but I’m glad I finally got the nerve to try some. I was at Starbucks and their scones looked so good. I knew I needed to take the plunge and try/buy one. I think it was the pumpkin or the blueberry scone. I’m not sure now, but I remember that I loved it. I ate the whole darn thing. Now I’m obsessed with any and all scones. See, this is the thing with me. I’ll say I don’t like something over and over again. Then I finally get the nerve to try it and a-ha I love it. Once I figure out I like it, I then become obsessed with it. I’ll eat it over and over and over, until I’m sick of it and don’t want them again. Then I move onto something else. It’s a vicious cycle. Are you like that? Since I went crazy for Starbucks scones, I knew I needed to come up with a scone recipe that was just as good, if not better. 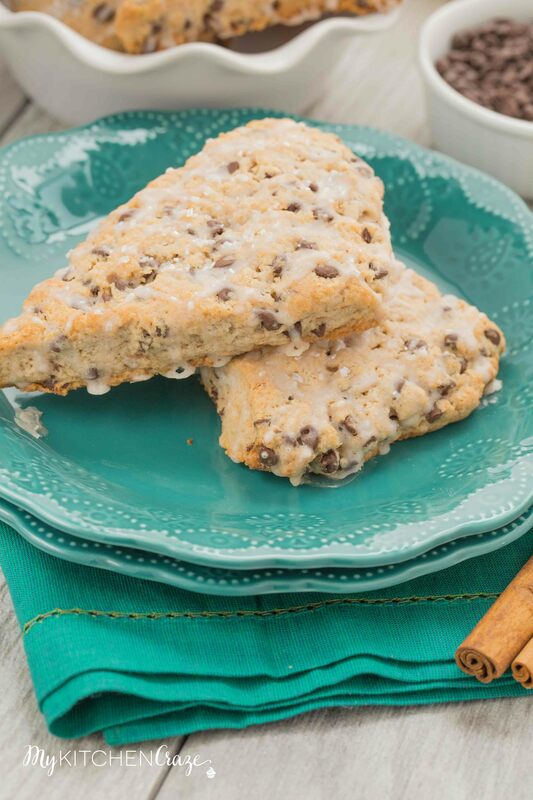 These Cinnamon Chocolate Chip Scones are it. I’ve made these scones so many times that I’ve actually lost count now. The family loves them! I decided to make these scones for my mother in law and her friend one weekend they were visiting. My mother in law dove right in and enjoy every bite, but her friend nicely told me that she didn’t like chocolate chips. I told her that I was sorry I didn’t make another recipe and left the room for a few minutes. When I returned I saw that she chomping down on the scones. Being a good daughter in law just giggled and winked at my mother in law. 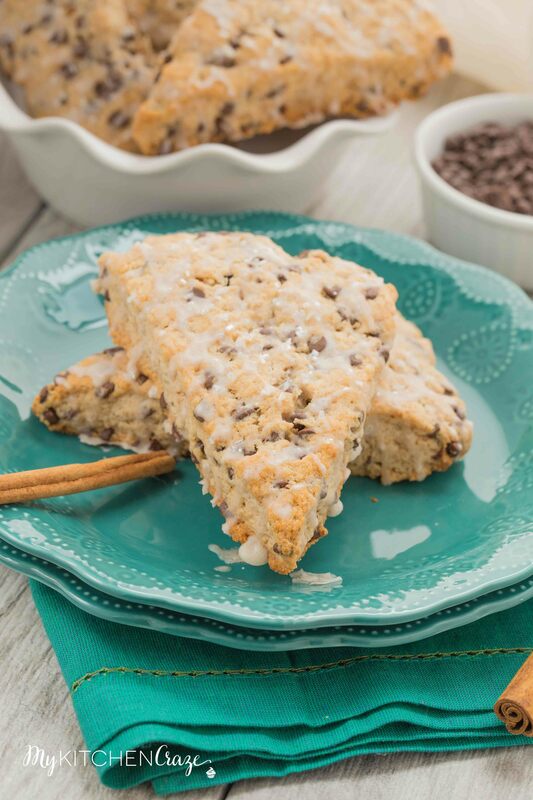 These scones are packed with chocolate chips and topped with a cinnamon glaze that’ll make them the most delicious scones e-v-e-r! They’re moist, crumbly and irresistible. Give them a try. Preheat oven to 400 F degrees. Line a baking sheet with a silpat or parchment paper. In a large bowl, combine the four, sugar, cinnamon, baking powder and salt. Whisk together. Add cold butter. Using a pastry cutter or two forks, cut butter into flour mixture, until butter is broken up into small pieces the size of large peas. The mixture should look sandy. In a small bowl combine vanilla extract and milk. Pour mixture into dry ingredients. Combine until the dough starts to come together and pull away from sides of bowl. Add in chocolate chips, stir until combined. Pat dough into a large disc about 3/4 inch thick on a lightly floured surface. Cut disc into 8 wedges. Place wedges on prepared baking sheet. Bake for 15-17 minutes, until the scones are lightly browned. Transfer scones to a wire rack to cool. Once the scones are cooled make the glaze: In a small bowl, add powered sugar, cinnamon, vanilla extract, and 1 tablespoon milk. Mix until glaze becomes a smooth, pourable consistency. Add additional milk a teaspoon at a time to thin glaze as needed. Drizzle glaze over cooled scones. Allow glaze to set before serving. If your dough becomes to dry, add in a few extra teaspoons of milk. If your dough is to wet, add in an extra tablespoon of flour or so. 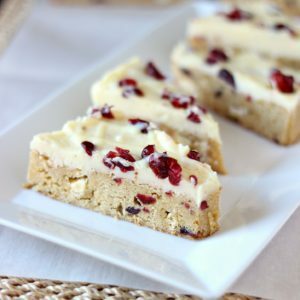 Want some more scone recipes? Here you go! Join my facebook group so you can stay up to date on all of MyKitchenCraze delicious recipes! These look delicious! Cinnamon glaze = YUM! Pinned! I think milk is missing from the list of scones ingredients! Scones are one of my favorites, too! I’m very picky about them though…they have to be just the right texture, not too dry or crumly! This version looks perfect, Cyndi! I wish I had one (or three) to go along with my morning cup of coffee! 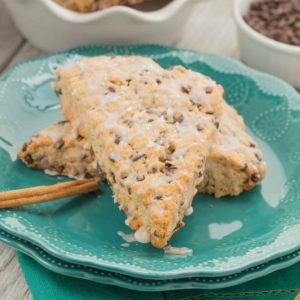 You can’t go wrong with a good scone recipe! Love the cinnamon in these! Yum, what a great flavor combo, these scones sound scrumptious! 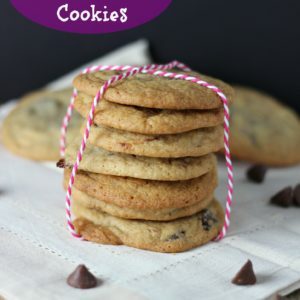 These look absolutely delicious — love all of the chocolate chips! I had cinnamon chip cookies for the first time recently and they were incredible! Cinnamon pairs so well with coffee or tea, and that’s exactly what scones are made to do 🙂 Love it! I could get myself into major trouble with these! 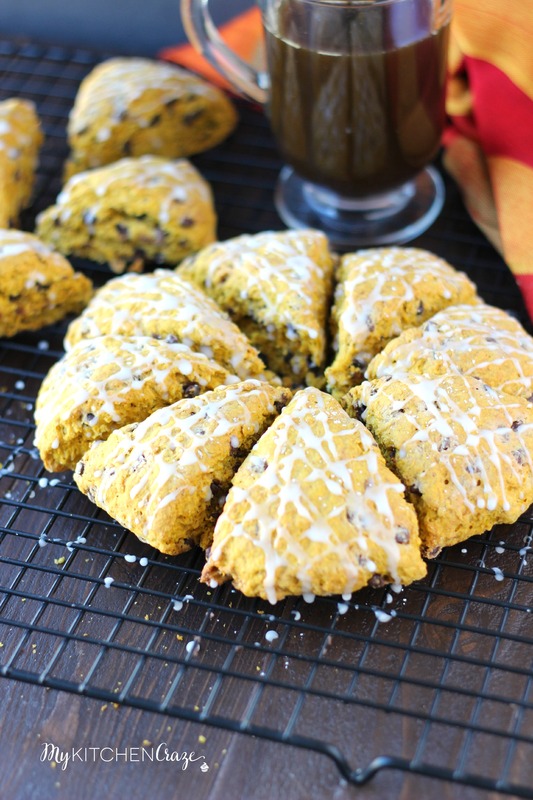 If I had a cup of coffee and a plate of these scones, my day would be made! Haha! I’ve always been the same way, scared to make them because whenever I got them in a coffee shop they were dry! But these look amazing and I LOVE the cinnamon and chocolate combo! Hi! Thank you SO much for this recipe! 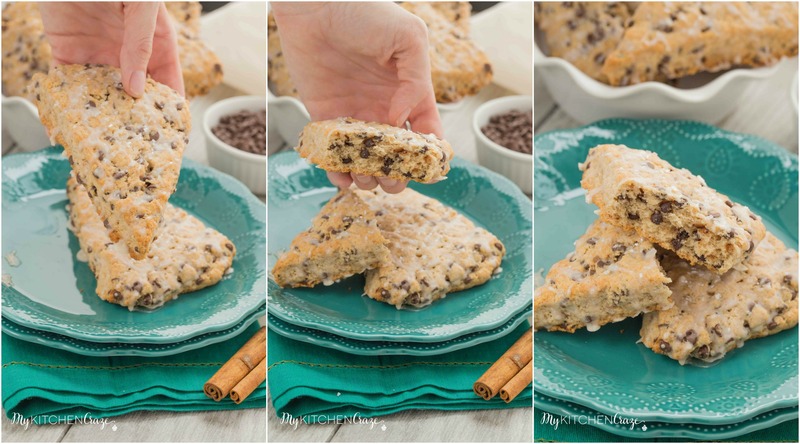 I love scones and this was such a simple and AMAZING recipe to use! Thank you! They taste so good! These scones are PHENOMENAL!! i Baked these as a “get well soon” treat for my grandmother and we all devoured them in one sitting! Thank you for this recipe, will definitely make again! I'm a busy wife and mother...who's making eating at home the new "IN" thing! You'll find that my recipes are easy go-to meals. ©2019 My Kitchen Craze. Design by Purr.